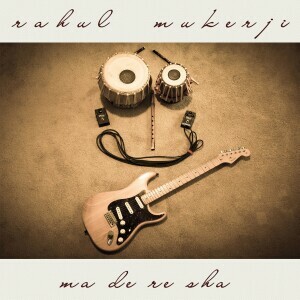 Rahul Mukerji is an Indian-born guitarist, composer, and visual artist living in Maryland, and ‘Ma De Re Sha’ is his debut recording. Mukerji plays all guitars, synth guitar, E-bow, tabla, sampling, and drum programming. Bruce Ng provides additional drum and percussion sampling, and Ruben Rubio plays bass. This album is a collection of 12 instrumental songs, with a widely eclectic and multi-cultural musical approach. The title track “Ma De Re Sha” got it’s title from a word, or phrase, that a 2-year old daughter of one of Mukerji’s friends would robustly exclaim for a variety of occasions. The origin of this exclamation is unknown, but the spirit and conviction of it provided inspiration to the recording of the album. Mukerji’s guitar style and various tones alone could make for a page-long exposé. The compositional themes jump from eastern rhythms to hard rock and jazzy progressive fusion-rock, with the guitar work front-and-center throughout. Sometimes clean and crystalline in it’s tone (especially on the acoustic tracks) but also tastefully processed electric sounds, which can inspire a dreamy ethereal introspective mood, as well as kick out a hard rock jam with the best of them. The ‘Ma De Re Sha’ album was five years in the making, and created with the assistance of musicians and engineers from four different countries. The ultimate takeaway, for Mujerji, was (in his own words), “the importance of forging and nurturing bonds despite any geographic and cultural distances. We may not have always been able to completely break through the language barrier, yet in music we found our common language. It was unity from diversity”.